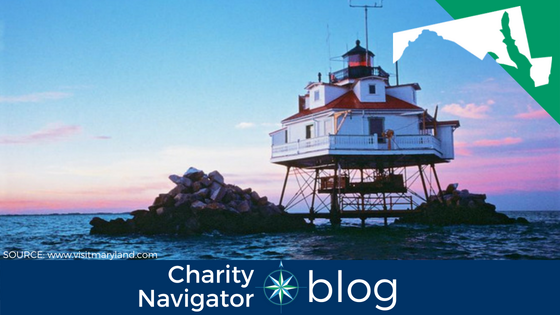 Each week, Charity Navigator's cross-country tour takes us to a new state where we stop and feature a few of the highly-rated charities at work there. Today we're in Maryland. Heading south from last week's stop in Maine, we find ourselves in the Chesapeake Bay state. Maryland boasts rural and urban areas, as well as diverse waterways and a beachfront. It is also home to nearly 150 highly-rated charities. Keep reading to learn more about a few of those organizations. Women's Learning Partnership (WLP) is dedicated to women's leadership and empowerment. At its essence, WLP is a builder of networks, working with 20 autonomous and independent partner organizations in the Global South to empower women to transform their families, communities, and societies. WLP's work uses the programmatic strategies of (1) leadership and advocacy curriculum development in 20 languages, (2) training at the grassroots, national, and regional levels (3) strengthening civil society, and (4) women's human rights advocacy and movement building. Our primary objectives are to increase the number of women taking on leadership and decision-making roles at family, community, and national levels, and to improve the effectiveness of feminist movements in Muslim-majority societies and globally by strengthening the capacity of our partner organizations. Established in 1969, Strong City Baltimore (formerly Greater Homewood Community Corporation) is a grassroots, nonprofit organization with a mission to build and strengthen neighborhoods and people in Baltimore. We help Baltimore's citizens get jobs, live in affordable homes, send their children to good schools, and build community ties. Much like the neighborhoods we serve, our programs support Strong City's approach to fulfilling its mission. Over the past 49 years, we have forged many successful partnerships, expanding the services we provide and widening our geographical range. We believe there are no quick fixes for the challenges that face Baltimore, but progress is achieved by building communities and building agency for individuals while helping them access the resources they need to improve their lives. The Academy Art Museum, which welcomes over 50,000 visitors annually, provides the knowledge, practice, and appreciation of the arts and to enhance cultural life on the Eastern Shore by making available to everyone the Museum's expanding collection, exhibitions, and a broad spectrum of arts programs. You can use Charity Navigator's Advanced Search Tool to find even more highly-rated organization serving the people and communities of Maryland.